Last May I fell in love with the castle on Eilean Donan in Scotland. 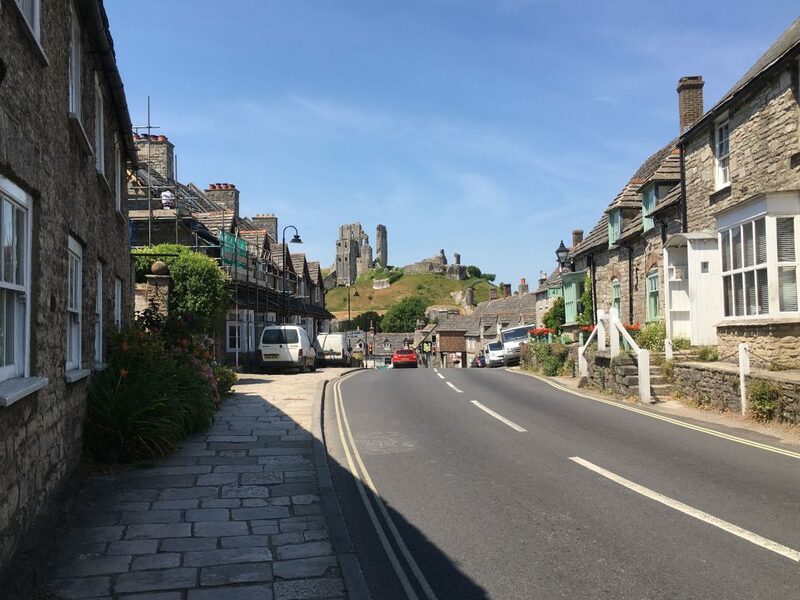 This month I visited Corfe Castle in Dorset. It was a boiling hot day and you can see from the photograph how parched the grass is on the walk up to the castle. The view of the village and surrounding landscape from the top of the hill was well worth the effort in the heat. 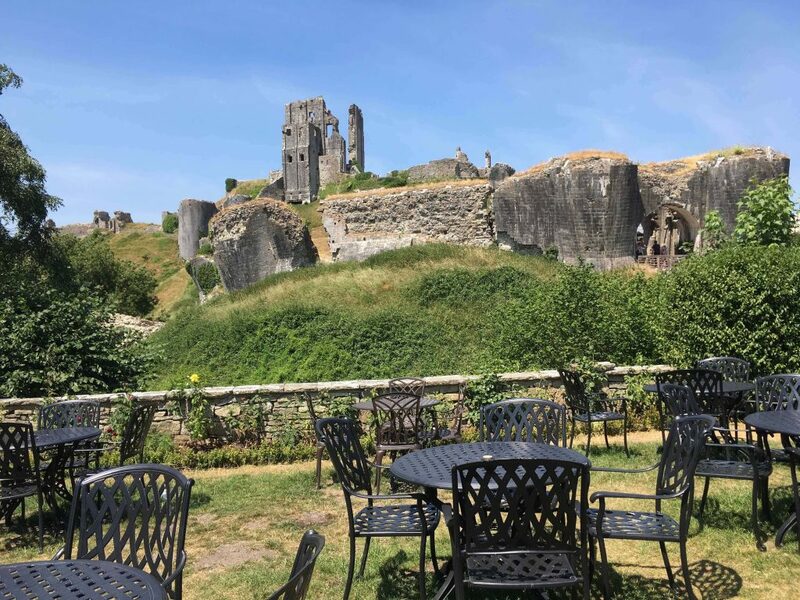 The dramatic ruins are in a perfect look-out position close by the principal route through the Purbeck hills, guarding the gap between the south of Purbeck, where marble was once quarried, and the rest of England. The earliest defensive site here may have been Roman and the first castle buildings were constructed of wood. 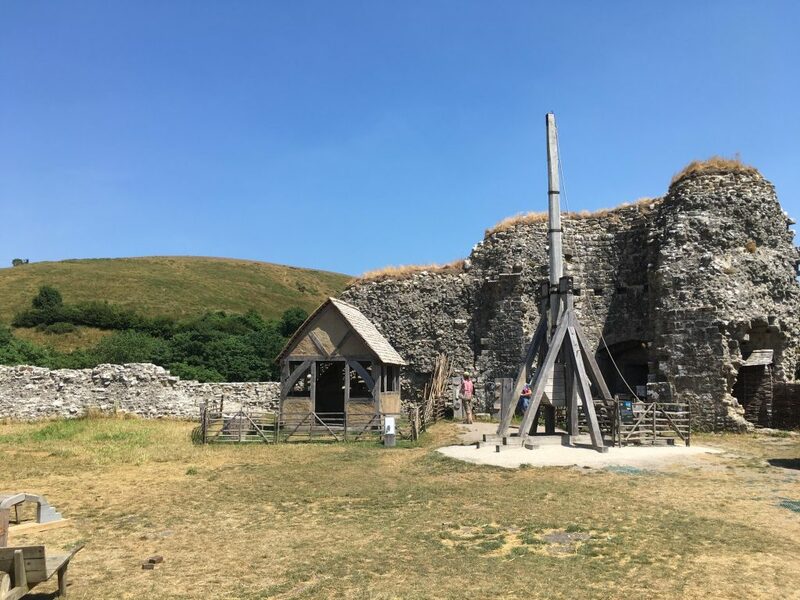 There is an interesting wooden replica of a trebuchet, or catapult for throwing large stones at the enemy, inside the fortified walls. King Edward was reputedly murdered at the castle in 979 by his stepmother, so that her son, Ethelred the Unready could become King. 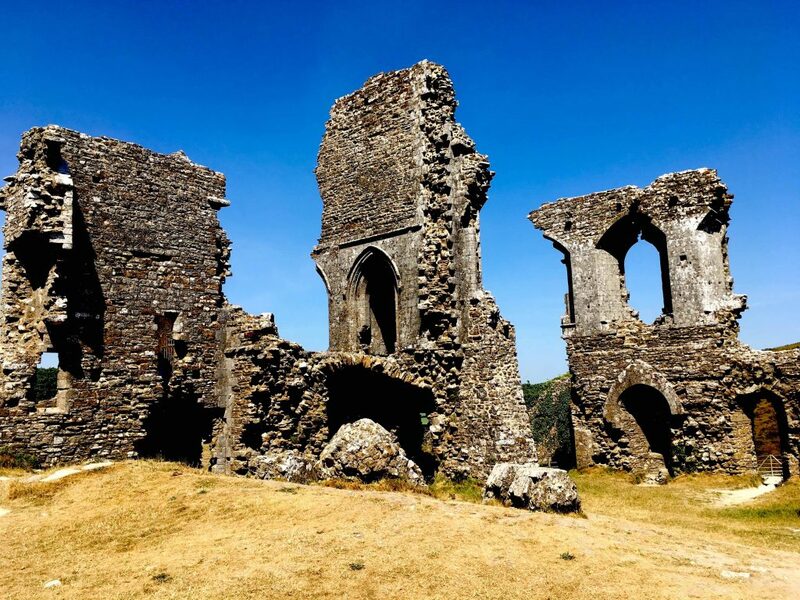 In the C11th the castle was rebuilt in stone by William the Conqueror and remained as a royal fortress for the next 600 years. In 1573 Queen Elizabeth I sold the castle to her favourite, Christopher Hatton. In 1635 the castle was bought by the Lord Chief Justice, John Bankes. 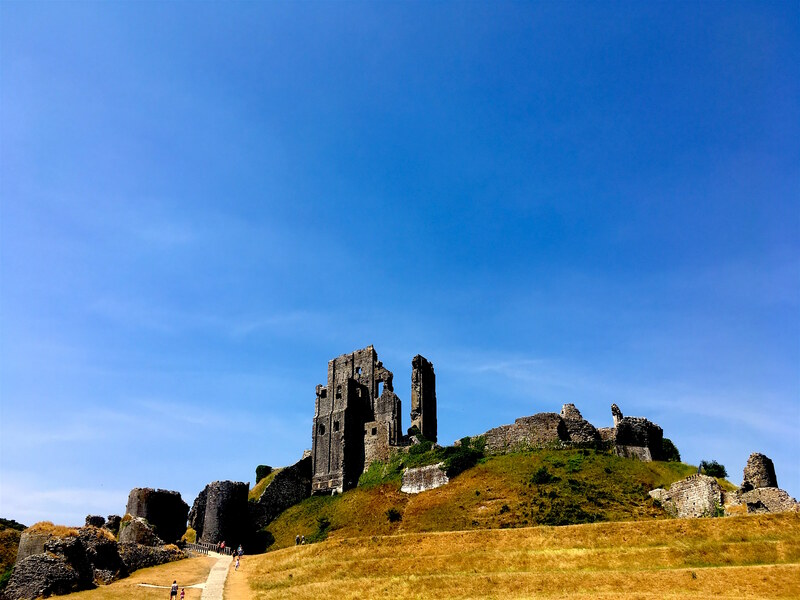 When civil war broke out in 1643, Corfe castle was the last Royalist garrison on the Dorset coast. When John Bankes was ordered to fight for the King in London, his wife Mary remained. 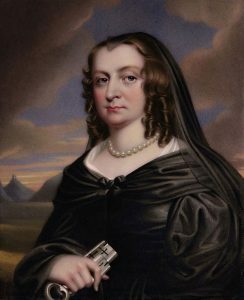 The Parliamentarian army demanded the surrender of the castle but Mary refused and, supported by her maids, children and five male servants, responded with cannon fire, driving the soldiers away. A month later, six hundred parliamentary troops began a siege of the castle. Mary and her small group of supporters heaved stone slabs and glowing embers over the battlements, killing over a hundred men. In 1646 one of her men betrayed her and she was forced to surrender the castle. Since she had shown such courage, she was allowed to keep the keys of the castle, which are now held at Kingston Lacey. 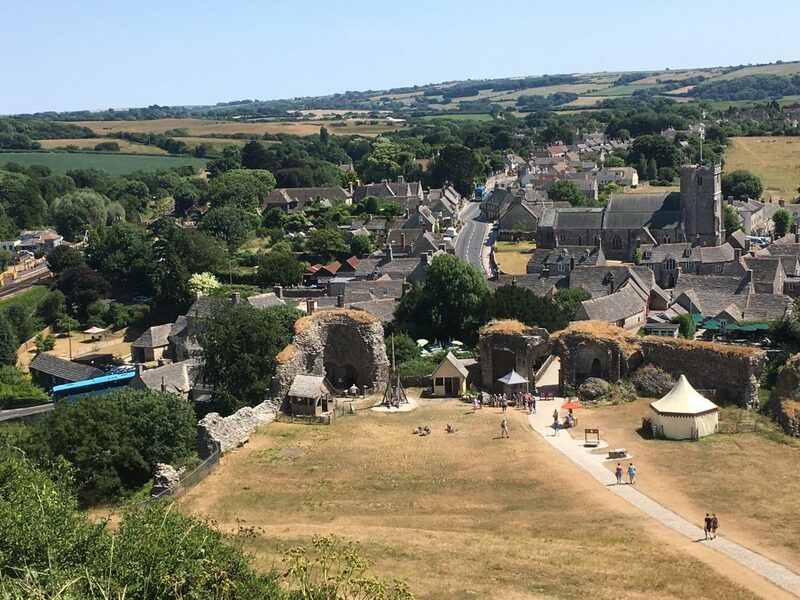 After I’d finished exploring the castle ruins and admired the far-reaching views, I returned down the hill and took a leisurely walk around the pretty village. Almost unspoiled, it would make an excellent location for a period drama. 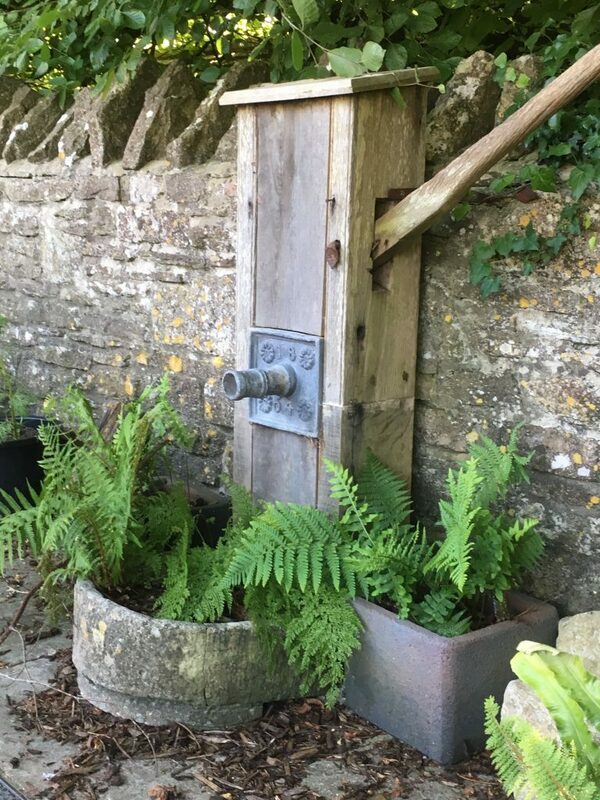 After my walk, I retired to a shady corner of the garden of the castle tea rooms, where I found this old wooden pump. 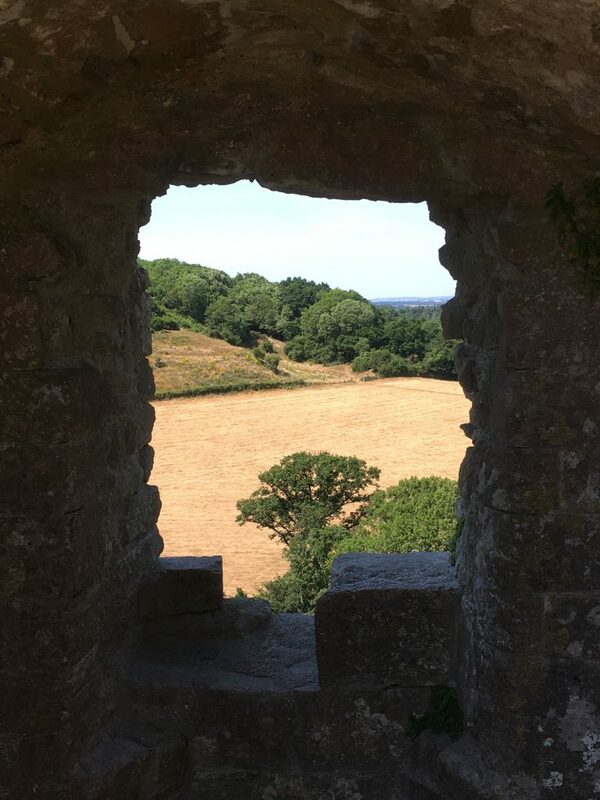 As I looked up at the ruined castle and relaxed with a delicious cream tea, it was impossible not to wonder about the lives of all those who had lived there over the centuries. What stories they could have told!